So with Valentine's Day tomorrow, I thought I'd share a little post about love. But it isn't the typical post you'd be expecting from me - I have already shared on the blog before the story of how Nate and I got together and many other things about us along the way. No today I thought we'd take a little trip way back to the story of my first boyfriend. Grab a coffee, get cozy, it's Days of Our Lives Middle School style. It was February 1996, I was 14 and at the tail end of eighth grade. And I was bumming because my latest crush (who happens to be a drummer for a fairly well known local band now) started "dating" (I put that in quotations because come on, how can you really date when you're 14 and can't drive?) another girl. I was tired of crushing on boys and getting burned. I was lamenting about this to my friend Jen (whom is also the same friend that I kind of credit with helping Nate and I get together in fact) when she was over at my house for a sleepover one night. She made a suggestion to me - a nice boy that we'll just call "D". She had actually "dated" him earlier that year, but stayed friends with him after they broke up. Through her I had become friends with him too but hadn't thought of him "that way" before. She listed all the merits about him and pretty soon we were writing him a note for me to give him "asking him out", because apparently we were radical women who decided a girl could ask a guy. We decided I'd give him the note on that following Monday. He and I were in the same health class and I delivered him the note at the end of the class. This was pretty big for me, in the past if I wanted to communicate with a boy that way I'd make a friend do the dirty work for me! This was right before our lunch hour and it was an agonizing rest of the day because I didn't know what he was going to say. He ended up writing me back and asking if he could call me that night, he didn't have an answer yet but just wanted to talk more about it I guess. So I gave him my number and said that yes, he could call me. He was the first boy that ever called my house. And we talked that night a long time, got to know each other better and he promised me he'd give me an answer within the next day or so (SO romantic, making me wait). The very next day he gave ME a note at the end of our health class and I met up with some girlfriends in the restroom before we went to lunch and started reading it. He wrote all these nice things and then at the end of the page said "Oh and my answer is...." and you flipped it over and it said YES in very big letters. Swoon right? Naturally, my friends and I started shrieking like 14 year old girls. 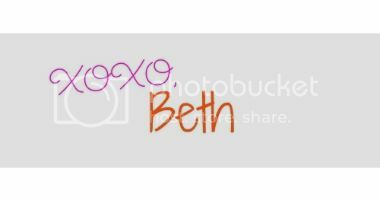 And of course, by the end of the lunch hour, everyone knew that "Beth and D" were going out. The next two weeks were as blissful as they could be for two 14 year olds who were dating but not able to really "date". We talked on the phone every night. We went to our Valentine's Day Dance together and I had my first slow dance. We gave each other Valentine's Day cards and presents. But at the end of those two weeks, everything came crashing to a halt when D decided to break up with me. And he made his friend do it for him. Yep, classy right? Of course I was absolutely crushed. But here's what's funny - we ended up talking after the fact and decided we wanted to stay friends and so really not that much changed....we even still talked on the phone most nights, we hung out with friends at school. We just weren't "linked". Eight grade finished up and summer came. We talked throughout the summer and even met up with a mutual friend of ours to hang out one day. Ninth grade began and we both found ourselves at the first dance of the year hanging out - we had each even been trying to help the other hook up with other people - but had both struck out. We were talking about how bummed we were when suddenly "our song" came on at the dance (oh yes, we even had a song, this was important stuff people!) so we danced and realized - we want to be back together. So, we gave it another go. And this time two weeks lasted closer to two months. It was much more of a real relationship this time, he even gave me my first kiss and I think we were even moving towards love. But again, we were so young and stupid and he was fickle - but I think he was also maybe smarter than I was and saw that really, we were just meant to be friends. So he broke it off again. And I was crushed again. This time I needed some more time to get over it so we didn't talk for a little while. But we were both in the school musical and we came to a reconciled place and got to be friends again and would remain friends. We almost gave it a third go on multiple occasions but I'm thankful that we didn't. I think we could have played the on again/off again game for awhile. In tenth grade I ended up in a pretty bad relationship for a little while right before I got together with Nate and I kind of stopped talking to D as much. After that relationship ended I started talking with D more again and even sought advice from him on the very school trip that I got together with Nate on, asking him if he thought I should go for it. He gave me the thumbs up and was actually very sweet about the whole thing. We kind of stayed friends the rest of that year, but the following year he turned on me a bit and said some hurtful things about Nate and I (probably out of jealousy) and our friendship kind of dissolved. We did manage to make peace by the end of high school, but we didn't really keep in touch after that. I don't think ill of him though. I look back on those days fondly. As first boyfriends go, he was a good one, he was courteous, kind, respectful. We had some good conversations and a lot of fun together. He wasn't my one true love, but he was still an important person in my journey. I heard he recently got married and I'm so happy he has finally found someone to share his life with. I wish him all the best and every time I hear "our song" I'll always remember our time together. 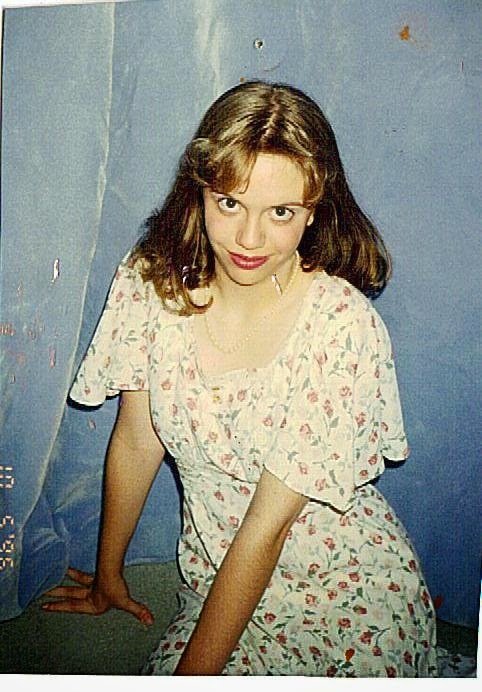 And for fun, here's a picture my friend Jen took of me to give to D back in the day - we did "Glamour Shots" at home for fun one night and this was the result. I mean come on, wouldn't you want to date this girl?? Ah, youth. Happy Valentine's Day everyone! I send you all love and kisses! !